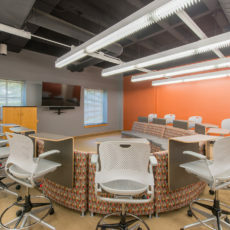 Changing the Game: Wabash College creates customizable, collaborative learning environment The Game Lab / Active Learning Center at Wabash College provides a dynamic environment that improves offerings for students and faculty while preparing them for the future. 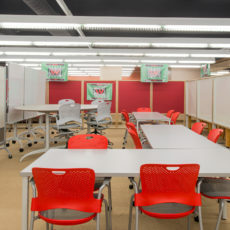 “Prior to the creation of the Game Lab / Active Learning Center, the space was just… space,” said John Lamborn, head librarian at Wabash. His team at Lilly Library had researched which resources rarely left the shelf, and after discovering some hadn’t been used since the turn of the century, they relocated the materials, opening up space in the building. “We weren’t sure what was needed at the time; we just wanted to make sure the space was there for students and faculty to use,” John said. Meanwhile, faculty members had approached the educational technology team—also housed in the library—requesting equipment for courses on video game design. The conversation quickly led to questions about where the technology would be housed. “I immediately thought, the library is open longer than any other building on campus. That’s exactly the kind of use we’d want for that area,” John said. 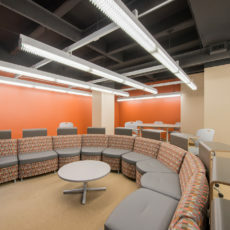 After a semester of testing the space with existing furniture, the professors determined the traditional classroom layout wouldn’t suit their activities. John explained his needs to Julie McGinnis, OfficeWorks’ account executive. They toured the facility, and Julie talked with faculty and educational technology staff to further discover what would work best. “Julie is knowledgeable and always comes up with great ideas, and that’s what happened with this project,” John said. Julie and OfficeWorks’ designer Emily Gerke quickly came up with proposed layouts and furnishings to meet the college’s goals. “OfficeWorks listened to us and, based on their experience, made suggestions to see what would excite and interest the faculty. The experience was wonderful,” John said. 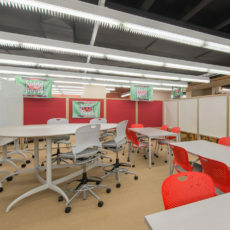 Products like Herman Miller’s Resolve system and the Exclave line accommodate different ways for students to study, work on team projects, and participate in group discussions through varied seating and table heights and movable elements. The furnishings incorporate durable finishes and fabrics and pair Wabash’s shade of red with timeless colors. “The goal is that you can walk in several years later and still have a fresh look,” Julie said. Feedback from professors and students has been positive. The library is open until 2 a.m., so students can reserve the center for collaborative study, club events, or recreational purposes, maximizing its use. “It has helped us meet a variety of needs, from formal instruction to students getting together to play video games or watch movies,” John said. Dr. Eric Freeze, associate professor of English and department chair at Wabash, teaches creative writing courses in the Game Lab / Active Learning Center, including classes on writing for video games. The space has been beneficial to his curriculum, which includes heavy doses of interactive projects and group discussions. He also likes the horseshoe seating configuration in the Active Learning Center.